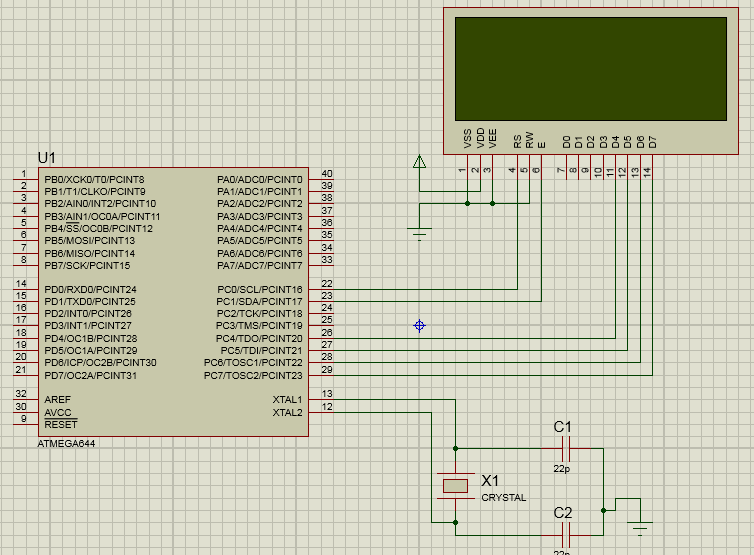 I am working on a project using ATMEGA644 DIP. In this I have written a program for LCD interface which is working fine in Proteus simulation, but on the hardware it is not giving me any response on LCD. As I observed may be my micro controller is not set on the external clock or it can be any other issue also, same program is working fine with ATMEGA32 with 16 Mhz external oscillator. Please help me out. Thanks in advance. Thanks for the response. Here is my my code. Your LCD is connected to PortC which is also the JTAG port which you've left enabled. 1. Excellent strategy to test first with Proteus before assembling hardware. 2. Even better that you have shown your fuses. 3. You have chosen the default fuses. This means JTAGEN. 4. 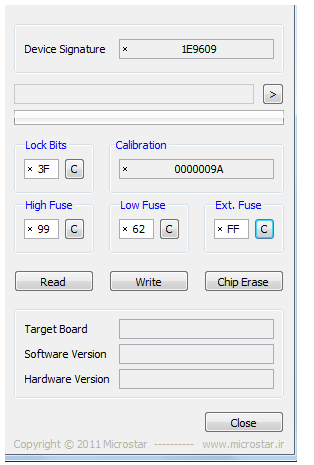 You are using PC4, PC5 which are JTAG pins. 5. 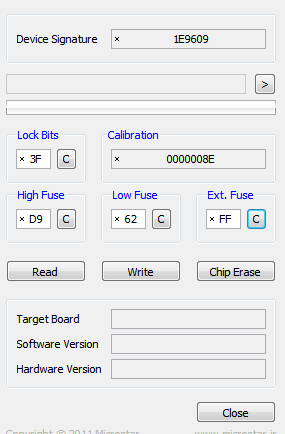 Either disable JTAG in software with JTD. 6. Or remove the JTAGEN fuse. 8. format the code neatly. this makes your code attractive to read. Most importantly, you will find it easier to understand. p.s. read the datasheet to see how to use JTD. Thanks for reply. Sorry for asking this how should I disable JTAG. I am new to this micro controller. Thank you very much issue is resolved by disabling JTAG. Shame that Proteus doesn't spot the JTAG issue - I'd say that's a pretty serious flaw. Or, better still use the JTAG pins for JTAG!! Having a device with on-chip debug and not using it is pure folly. You are tying your own hands behind your back! One more thing I required to know. How to set atmega644 for using external crystal on 16 Mhz frequency. How to set atmega644 for using external crystal on 16 MHz frequency. Reading the datasheet should be your first step in finding out how to use any feature of any chip! I have tried after making CKSEL3..0 pins disable but still micro controller is not using external crystal. On the contrary - I applaud Proteus for getting the simulation right - it spotted that JTAGEN was enabled so prevented C4..7 being using as normal IO. (just like would have happened in the real silicon). But he said it worked in Proteus? How are you determining that it is not using the external crystal? Tell us the precise fuse values (preferably as read out in hexadecimal). When i am printing a long string on LCD it's speed is slow but when I am using atmega32 it is prining the same string in good speed with same crystal and same program. Those fuse values seem to be for internal RC oscillator. I have made CKSEL 3..0 as 0000 but still not getting the required output at 16Mhz. I have made changes in fuse values and my both micro controllers are showing "Programming failed". That could be bad or really bad. Locate the tutorial "Resurrecting a bricked AVR" (or a title similar to that) in the Tutorials forum here at AVRfreaks and read. Unless you've messed with the SPIEN fuse there are relatively simple ways to fix it. Can you please tell me the exact fuse values to set it on External crystal of 16 Mhz?? 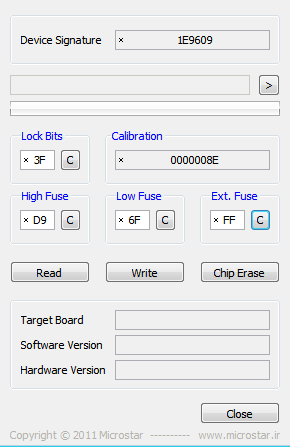 While trying to set the atmega644 on external crystal I messed up with fuse values. Now I am getting this error. Is there any solution available for this issue?? Now I am getting this error. Is there any solution available for this issue?? Three posts up I told you to go locate a tutorial here on AVRfreaks and read it. With 99% certainty it applies to your problem. In fact, the situation you're in is so common someone decided to instead of answering every time the question was asked, to write a tutorial covering it. Depending on things unknown to both us and you ATM, there is no one distinct solution to your problem. It will be a matter of trial and error. Read the tutorial for the details. No, no-one will re-type the test of that tutorial just so that you will not need to locate and read it in it's current place. But, since you likely have "bricked" your AVR (by programming some unknown but really bad fuse values) you first need to try to fix that, as described in the thread i linked to above.